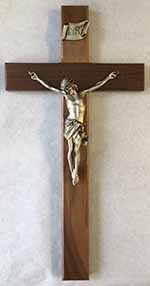 15" Wall Crucifix with 6" metal corpus finished in silver. Emblem of the Order or 4th degree emblem placed on cross. Ideal for monthly attendance award or prize, or committee and chairmanship awards.